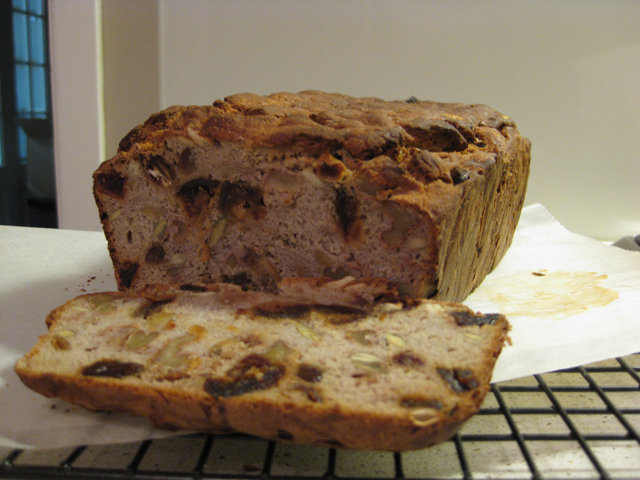 This recipe produces the most amazing fruit loaf – great freshly baked with butter or to toast. Yummmm. Updated this recipe to my new and improved version April 2015. 1 tablespoon (or more if you like them) sesame seeds. In 100ml of water, soak 25g chia seeds and 25g flaxseeds until a gel forms – about 15 minutes. Make your chia/flax gel by soaking seeds in water for 15 minutes or longer if you prefer. Lightly grease and line with baking paper a large bread/loaf tin. Add all the dried fruit and nuts and seeds and the chia and flax gel and mix well. In a separate jug combine 400ml of warm water with the oil. Add to the dry ingredients and mix with a wooden spoon well combined. Stir it really well. Leave to rise in a warm spot for at least 20 minutes or so, longer if possible, I find about an hour is good. Your mix will rise in the tin. When the mix has risen to almost the top of the bread tin, I preheat my oven to moderately hot, about 200 deg celcius. Bake for 40 until bread crisp and a nice golden brown. Remove bread from tin, reduce oven to moderate (180 deg celcius) and return to oven upside down for about 10 minutes at the end of cooking until nice and golden brown on all four sides. This ensures that it is well cooked all the way through and gives a nice crust on all four sides. The bread is cooked when it sounds hollow on all sides when you tap with your knuckles. Place on wire rack to cool (not in tin or it will sweat). Wait until cool before slicing. Throw all dry ingredients into food processor bowl and blend until combined. If you have a thermomix you can measure straight into the bowl using the included scale. Add water, oil, and chia and flax gel to the dry ingredients and mix until well combined (I use speed 5, about 10 seconds). Add nuts and seeds and dried fruit, if using thermomix mix on reverse for about 6 seconds speed 6 or otherwise mix by hand so nuts and seeds don’t get too chopped up.